I honestly can’t remember what life was like before I logged on to the Internet. That could either be because I’m known to have a really bad memory, or because being online has been such a major part of my life for quite a few years now. Click through to learn why I've joined Dove to spread their #SpeakBeautiful mission! Being “online” has just always been my thing. As a shy girl, I found that I could always express myself here in ways that I once couldn’t in person. It began with AOL/Yahoo chatrooms and virtual reality communities before I transitioned into the infamous world of social media. To me, social media was the best thing ever invented. I could share my thoughts and communicate with a bunch of different people without having to worry about the awkwardness or embarrassment that could result from a face to face interaction. However, it wasn’t very long before I realized that what I considered as my safe space…wasn’t always so safe. Just like I enjoyed the luxury of being behind a computer/phone, so did a lot of other people and sometimes these people weren’t always very nice. Social media gives people the ability to say whatever they want/when they want, no matter how nasty, and feel completely invincible. I can't count all of the times that hurtful things have been said to me online (high school was the worst) and it took me some time before I truly learned how to block all of the noise. At the end of the day, I still saw the wonderful opportunity that lied within having an online presence and using social media. It was in high school where I also discovered my love of blogging. I was able to create my own platform and talk about everything from celebrities and fashion to boys and braces. Who would have ever thought that people would actually enjoy my content and even relate to it? The encouraging comments came pouring in and it was then that I knew that I had the ability to create a positive space online all on my own. My blog lead to me earning an internship with Seventeen Magazine and College Fashionista while in college and eventually the career job that I hold now. Through all of those experiences, I am able to share PaigeMariah.com confidently, (from behind a screen AND in person) as a resource for young women who are just trying to figure things out and live their best life, just like me! That’s why I’m so excited to be partnering with Dove in an effort to encourage women and girls to change the conversation online and make social media as a whole a much more positive space. Did you know that 52% of girls think that negativity they see online damages their confidence? * Imagine how quickly we could change things if we made an effort to share encouraging words with at least one person online each day! You can start by joining me and promoting Dove’s #SpeakBeautiful mission! 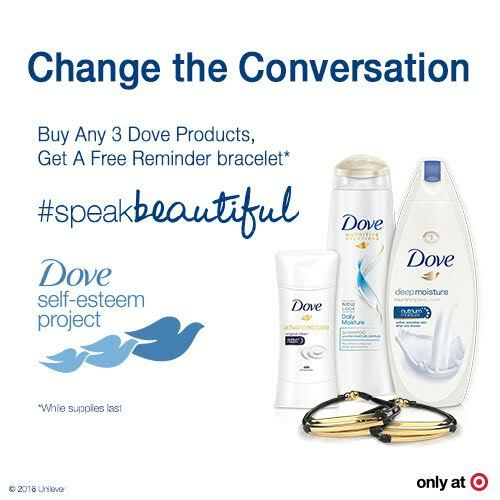 All you have to do is head into Target, pick up three of your favorite Dove products and you’ll receive a free #SpeakBeautiful bracelet. Then, every time you type, you’ll look down and be reminded to put a positive message out there. I feel the positivity oozing out of my fingers already! Click here to purchase your 3 products online and receive your #SpeakBeautiful bracelet. Come on guys, we can totally make this a thing. From this point forward, let’s never forget to #SpeakBeautiful!